And speaking of winners.... The winner last week's give and her very own copy of The Little Tiny Rooster .... is Amber! Please e-mail me your info to webe(at)soon(dot)come, and I'll ship it out as soon as I return next week. That said, have a great one guys.... I'll still be posting this week and next, so fear not! Oh, Petunia. Good one. Congrats on your Etsy shop, by the way! Hoping to check out your shop later today! Oh, Petunia--we would love this one! Thanks! Cute!! and i love that it is a hardback!! Have a nice trip! I have been looking out for this book- how fun would it be to win! That is a good one! We also love Veronica the hippo. We love books about ducks and geese and usually have to read the library copies. It would be a treat to own one! I'm off to browse the new shop . . . I found your blog today from the Angry Chicken, and spent far too much time browsing. :-) Looking forward to spending alot more time here. We love books at our house, and always have room for one more. 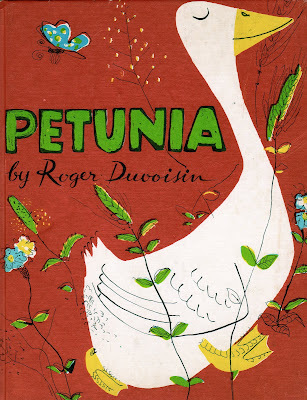 Oh to be named petunia!